HIGHLAND PARK, Mich. — When you place an order for delivery, you want the food to get to you fresh and fast. 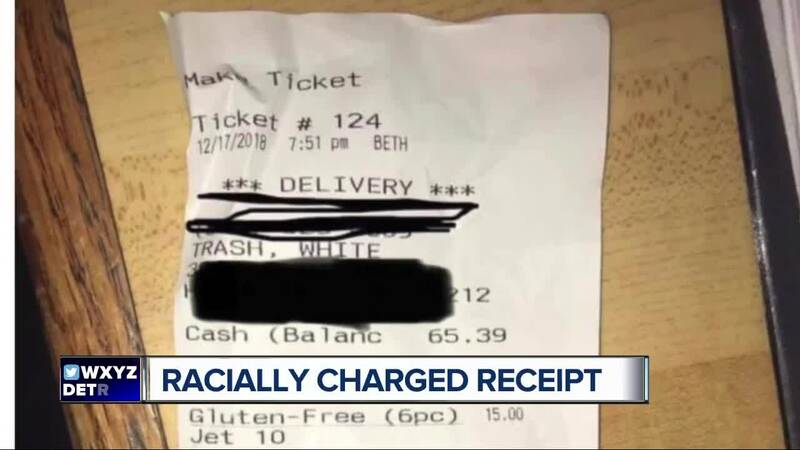 WXYZ spoke with one of the customers who posted the receipt on social media. Jason Charboneau says he’ll never go back to the establishment after the way he and his co-workers were treated. "It becomes a hurtful thing. It’s like you have no clue what you’re judging me on. Don’t judge. Stop the hate," he says. Regarding the incident from last night, as soon as we found out about this situation, we contacted the customer to let her know, that the behavior she experienced is unacceptable and a clear violation of our service standards. We apologized and assured her that we, as a company, do not tolerate this type of behavior, in our stores. We have since made suggestions to managers of this franchise, location, on how to deal with the employee, who caused this regrettable situation. Jet’s said they will refund the money to the customers who received the hateful receipt and offer them a store credit as well.